working along the trail near mile marker 4.5 on June 25, 2018. 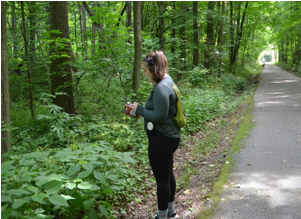 This issue’s naturalist corner centers around a photo of me working along the Pumpkinvine Nature Trail in late June. In the photo, I am using my cellphone in way you might interpret as disinterest in the nature surrounding me. Typical 20-something, right? A common narrative these days is that teenagers and young adults only care about electronic devices to the detriment of all else (National Geographic published a piece in October 2016 titled “Can the Selfie Generation Unplug and Get into Parks?”). But I believe this narrative of technology as evil and harmful to the natural world misses a key element of modern naturalist studies: the ability to use technology as a tool to enhance the range of identification tools (iNaturalist is my favorite for identification help) and management strategies available to everyone. In the photo of me on my phone, I am actually using an app to mark and label the GPS location of a clump of wood nettle. MapsPlus based on data taken on June 25, 2018. 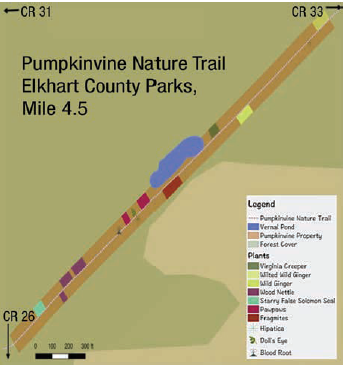 With that datum point and many others taken along the stretch of continuous forest, I was able to create the map (Image 2) that will help myself, the parks departments and any future volunteers know where to begin their work on managing invasive species threatening the natural area around the trail. So, what does it mean to be a modern naturalist? Basically, the same thing it meant to be a naturalist during any other time, but with the addition of embracing technology as a way to better understand and protect the nature around us.